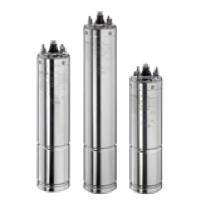 SAVA rewindable 4" oil filled submersible motors are designed to operate dependably in 4" and larger boreholes. Non-toxic oil – Premium quality, colorless white oil meeting the requirements of international and national authorities. Special stator design for high starting torque. Unique single-phase electrical design for PSC starting, and starting capacitor + PSC starting. M. Presco Co.,LTD. 368/3 Moo 8 Prakasa Rd., Taibanmai, Muang, Samutprakarn 10280 Thailand.